On 23.8.10 the seven NOAM "shinshinim" who elected for a year in Ashkelon met at Kehillat Netzach Israel for morning prayers with Lorna Szefler (kehilla chairperson) & Rabbi Michael Ben David. The young volunteers are currently living in the Bet Canada Absorption Center not far from the kehilla & will be working in educational programs all over the city, including our own Afternoon Day Care Program run in the 5 on-site TALI preschools. They will also be running NOAM branches in Ashkelon, Rehovot & Beersheva. 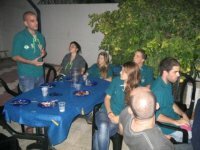 Kehillat Netzach Israel is officially "hosting" this innovative NOAM Shnat Shirut urban program, offering support & services to the volunteers, welcoming them into the congregation & helping them to settle in. 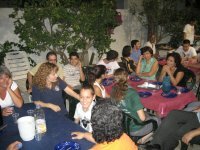 On 30.8.10 at a BBQ evening held at the Davis family home, the Shnat Shirut volunteers were introduced to their "foster families". 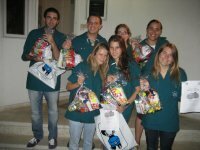 These are all active kehilla members who will be providing "home from home" care to the volunteers on a regular basis, especially during their shabbatot in Ashkelon. may this be a happy, peaceful & successful New Year!